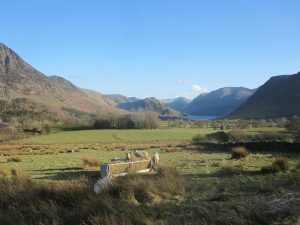 The weather in Loweswater has been lovely for the past few days, slightly hazy but with blue skies and no wind and the last remaing bits of snow are disappearing from the fell tops. I have been taking advantage of the nice weather and have been working in the garden for the past two days. Yesterday afternoon I became aware of a group of people with lots of very expensive looking photographic equipment taking pictures around the seat! 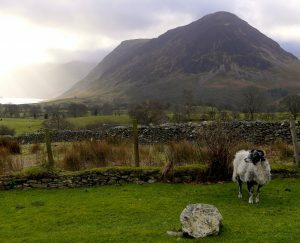 The sheep in the field in front were being very obliging and posing with interest but I suspect they were thinking food. I thought it would be fun to have a happy snappy of the scene! 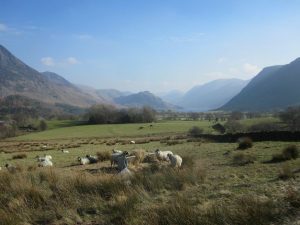 Today it was clearer and I couldn’t resist taking a photo towards the lake with the sheep eating their hay. 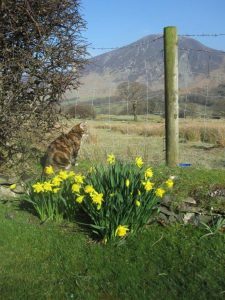 The daffodils are now out and looking very pretty and as I was photographing Peggy decided to pose alongside! There has been a change in the photos taken around the seat over the past few weeks and one is aware of Spring approaching. It has been difficult taking photos during the winter in the morning as the sun is so far south and low in the sky. My son, Ian and his girl friend, Emilia visited a couple of weeks ago and Emilia took a nice picture of an early morning visitor looking for some tasty breakfast! 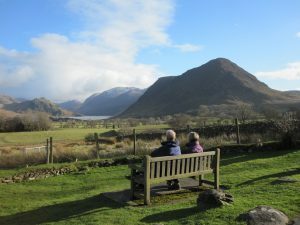 The sun is now also becoming warm enough for visitors to sit on the seat for a little while. 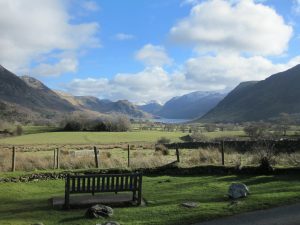 The snow is fast disappearing off the higher fells: the following two photos were taken four days apart. I am keeping an eye on the daffodils by the seat and will post when they are out!